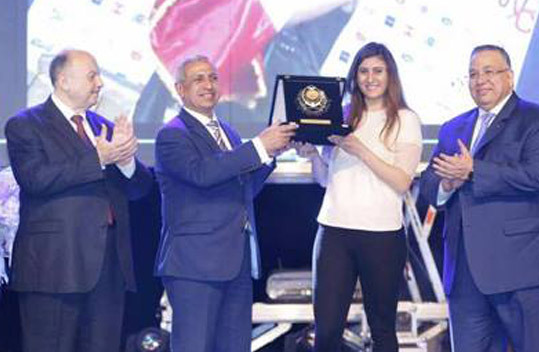 She is an Egyptian professional squash player who became the youngest women to win the Women&apos;&apos;s World Championship On 30 April 2016.It is worth mentioning that Nour El Sherbini produced one of the greatest comebacks in World Championship history in the final of 2016 Naza PSA Women’s World Championship in Malaysia to become the youngest winner of the biggest title in Women’s squash as well as the first female Egyptian ever to become the World Champion.Nour is a student at AASTMT College of Management and Technology, Media Management department. AASTMT had participated in 2012 international competition of Remotely Operated Vehicle (ROV 2012), that was held during June 21 - 23, 2012, at the Aquatic Center in Orlando – Florida - USA, where AASTMT was part of the team that has represented Egypt and the Arab region in this international competition, and that comes within AASTMT strong keenness on supporting scientific personnel and the pursuit of elevating the level of education & scientific research, as AASTMT role on the development of the educational system in various different scientific fields. It is worth mentioning that AASTMT has won the regional Competition of "Explorers" at the Remotely Operated Vehicle regional Competition - ROV 2012, which was held during April 19 - 22, 2012, and that was organized by AASTMT Regional Informatics Center and Hadath Company for innovation under the supervision of the Marine Advanced Technology Education (MATE) and the National Aeronautics and Space Administration (NASA). AASTMT Cairo College of Engineering & Technology students has participated in a competition that entitled: "Minesweepers: Towards a Landmine-Free Egypt", that was held during 16 - 18 September 2012, and it is a national robotic competition aimed at fostering robotics research and its applications in the area of humanitarian demining in Egypt. Minesweepers considered to be the first national robotic competition with high social impact due to tackling a serious problem of humanitarian demining in Egypt. Minesweepers will raise the public awareness of the role of science and technology in solving this problem and will motivate professors, engineers and students working in this pertinent area of national importance. In Minesweepers each participating team will construct a teleoperated or an autonomous robot that should be able to search for underground and aboveground anti-personnel mines and produce a map of the detected mines. The robot has to be able to navigate through rough terrain that mimics a real minefield. Minesweepers is organized by IEEE Robotics and Automation Society (RAS) Egypt chapter and sponsored as hosted by the German University in Cairo (GUC). Minesweepers is also supported by the Executive Secretariat for the Demining and Development of the North West Coast, Egyptian Ministry of International Cooperation. Minesweepers: Towards a Landmine-Free Egypt is held in conjunction with the Egyptian Engineering Day 2012. 97 Teams from different Egyptian and non-Egyptian universities, institutes and research centers have been registered to participate in Minesweepers: Towards a Landmine-Free Egypt. Results: 1-EMAR, Ain Shams University 2-Pegasus, Arab Academy for Science, Technology & Maritime Transport 3-Caetus, Mansoura University. 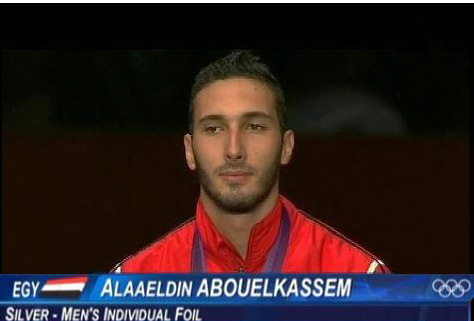 The Fencer AASTMT College of Engineering and Technology Student, Alaaeldin Abouelkassem has won the first silver men’s individual foil at London 2012 Olympic Games after performing a distinguished final match which was held on Tuesday 31- 7- 2012 in front of the China player, Lei Sheng. The first silver at London 2012 Olympic Games of AASTMT College of Engineering and Technology Student is considered to be a culmination of AASTMT role in the care of athletes and the adoption of talented young people, where AASTMT has participated with a large number of players in individual and team sports. It is worth mentioning that the Fencer, Abouelkassem Alaaeldin is a student at the Department of Electronics and Communications of AASTMT College of Engineering and Technology. 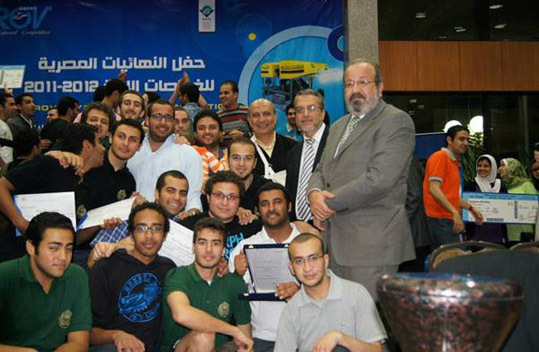 Within the role of the Arab Academy for Science, Technology and Maritime Transport (AASTMT) in encouraging the Egyptian and Arab world students to participate in international competitions, AASTMT had participated in the 24th International Olympiad in Informatics (IOI&apos;&apos;2012) which is an international competition that was held in 23 - 30 September 2012, at Sirmione - Montichiari, Italy. The Egyptian team has succeeded to receive two bronze medals, as three jobs in Google, Facebook and Microsoft Company were earned by three AASTMT students who oversaw the training of the participated teams. The Arab Academy for Science, Technology and Maritime Transport (AASTMT) had participated in the 3rd Mediterranean fishing Championship that was organized by Yacht Egyptian Club in Alexandria and was held on Saturday 6th October 2012, at the territorial waters of the coast of Alexandria, from 6:00 am to 5:00 pm. AASTMT team had won the first place in the Championship, achieving the largest weight of fish (weight of 36.200 kg of fish), by using AASTMT "Persian" boat. As AASTMT fishing team members were: * Captain/ Ahmed Abdel Dayem - AASTMT Maritime Safety Institute – Captain of AASTMT fishing team * Captain/ Hisham Hilal - Manager of AASTMT Maritime Center for graduates Affairs – Member of AASTMT fishing team. * Doctor/ Gamal Ghalwash - AASTMT Vice-President for Maritime Affairs - Member of AASTMT fishing team. Within Google&apos;&apos;s program for the World Universities, which aims at spreading the awareness of the usage of information technology and maximizing its usage in schools, AASTMT College of Computing and Information Technology had introduced a proposal of a workshop for the schools information technology employees and that through the competition announced by Google&apos;&apos;s global company that entitled "CS4HS: Computer Science for High Schools", as it was a worldwide competition for the year 2012, where the company announces for a grant for the winner which is estimated at $ 14000. 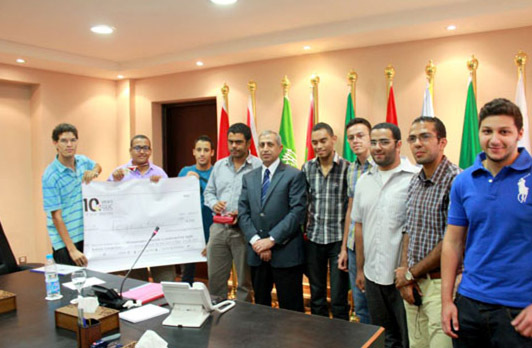 As AASTMT Alexandria College of Computing and Information Technology has won Google&apos;&apos;s global competition Grant for 2012, and this shows AASTMT role in servicing the Egyptian society. Professor Ghada El-Kot, professor of human resources and organizational behavior at the Graduate School of Business in Arab Academy for Science, Technology and Maritime Transport, won the "Outstanding Paper Award" from Emerald Literati Network 2011 Awards for Excellence, the largest publishing house in the world. 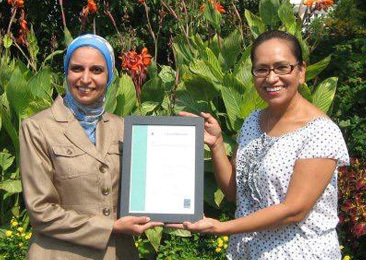 The Committee has indicated that Professor Ghada El-Kot&apos;&apos;&apos;&apos;s research was one of the best researches published in 2011. 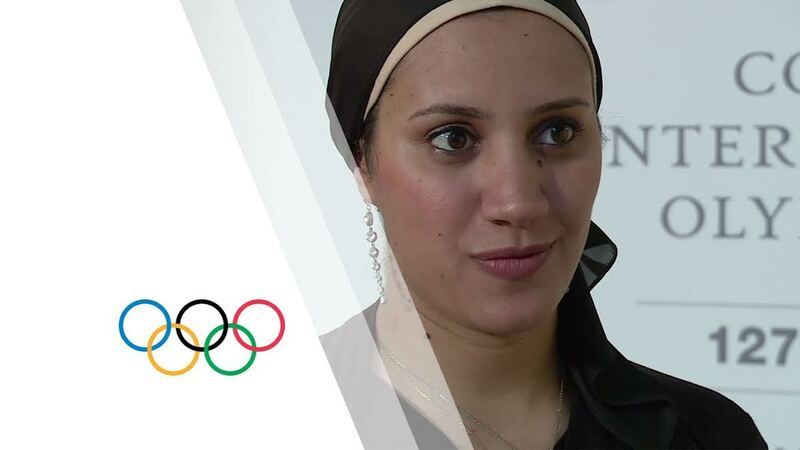 Ms. Aya Medany,Assistant Lecturer at AASTMT College of International Transport and Logistics is a member of the Public Affairs and Social Development through Sport Commission of the International Olympic Committee. Dr. Sherif Farouk Mohamed Farid Badran - lecturer at The Arab Academy for Science, Technology and Maritime Transport "AASTMT" - Marine Engineering Department, Succeeded to win the faculty of Engineering - Cairo University Best Thesis Award for the academic year 2008- 2009 that is entitled "Buckling Analysis and Optimization of Y and T Stiffeners in Double-Skin Ship Structure".